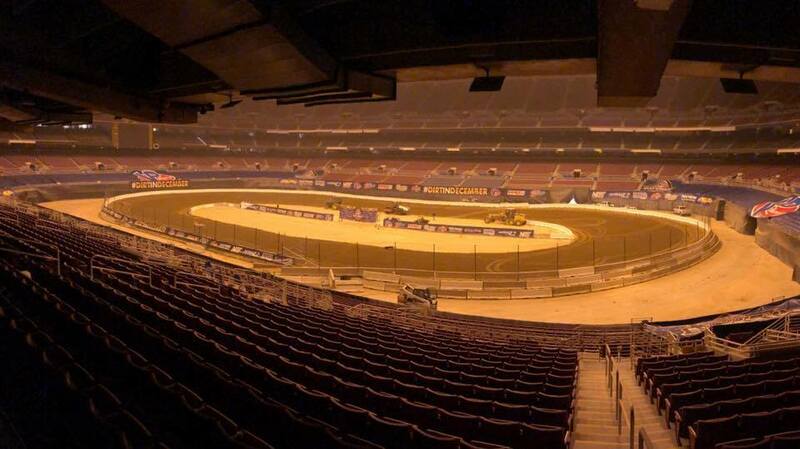 On Tuesday ahead of the 2016 Gateway Dirt Nationals, Kenny Wallace and Kevin Gundaker suited up to turn the very first laps around The Dome. After months of speculation about the quality of the race itself, that test proved that it could be done and that everything would be just fine. On Tuesday ahead of the 2017 Gateway Dirt Nationals, Landon Simon unloaded a full blown sprint car and a dirt midget. That was a test for what you’ll see this weekend. Dirt midgets have been added to the ticket. On Tuesday of this week, event promoter Cody Sommer jumped behind the wheel of a race car. Casey Shuman Racing unloaded thier dirt midget and Cody Sommer zipped up the racing suit. It was his first time behind a wheel in eight years and he’s never raced a midget or sprint car before. The car was previously driven by Landon Cassill in the BC39 race at Indianapolis Motor Speedway. Sommer previously drove dirt race cars before grabbing the hat of dirt track promoter. He was also a former crew member for a NASCAR team. The 2018 Gateway Dirt Nationals track has been modified slightly. In previous years, there was a gap of concrete between the track and the inside wall. This year, the tracks surface goes all the way to the inside wall. At the center of the corner, the track is a bit narrower than previous years. The tire barriers now rest on top of the dirt inside of on the concrete. Watch the video of the Tuesday dirt midget test below.